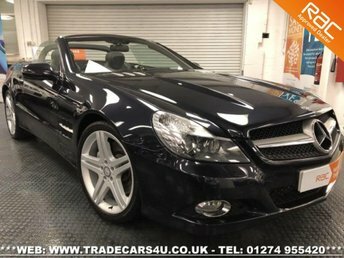 This is a beautifully presented SL350 with low mileage and a great history behind it. Some of the main features are : All Previous MOT's Supplied For Mileage Verification---Full Mercedes Service History to 47,997 Miles---19" Unmarked Alloy Wheels / 4 Good Tyres / Wider Rears---Full Black / White Stitched Leather Interior---Fully Electric Seats Inc Leg Extenders and Lumbar Settings---Twin 3 Stage Memory Seat Function---Multi Stage Heated Seats---Command SAT NAV / Infotainment---Fully Electric Operated Roof with Glass Pan Roof / Blind---Adaptive Airmatic Suspension---Multiple Safety Airbags - Pass On/Off---Electric Heated Power Folding Mirrors---Cruise Control with Speed Limiter---Radio/6 CD/USB/AUX/DVD/Mem Card/iPod/HDD---Electric Retractable Anti Roll Bar---Retractable Wind Deflector---Glovebox Cooler---Bluetooth Telephony---Mercedes Benz Embossed Sill Plates---Front / Rear Parking Sensors with Visual Aid---Auto Headlights---Follow Me Home Lights---Xenon Headlights / Headlamp Washers---Twin Chrome Tail Pipes---Soft Closing Tailgate---Spare Wheel---Tool Kit---1st Aid Kit---Locking Nut---2 Remote Keys Any inspection as always is most welcomed and we are happy to do you a full walk around and talk tour of this car, also a live walk around video is available. You can live chat us anytime at your convenience on our website. Buy with complete peace of mind knowing that you are buying from a fully affiliated Dealer that has been well established since 2003 with over 30 years experience in the Motor Trade. We look forward to your call.